Surprisingly, no book of quotations on God and religion by atheists and agnostics exists. Luckily, for the millions of American nonbelievers who have quietly stewed for years as the religious right made gains in politics and culture, the wait is over. 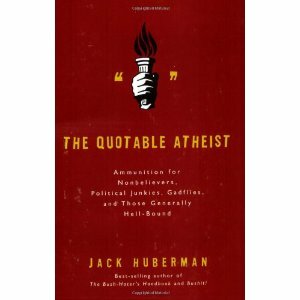 Bestselling author Jack Huberman's zeitgeist sense has honed into the backlash building against religious fundamentalism and collected a veritable treasure trove of quotes by philosophers, scientists, poets, writers, artists, entertainers, and political figures. His colorful cast of atheists includes Karen Armstrong, Lance Armstrong, Jules Feiffer, Federico Fellini, H. L. Mencken, Ian McKellen, Isaac Singer, Jonathan Swift, Ludwig Wittgenstein, Virginia Woolf and the Marquis de Sade. Jack Huberman lives in New York City and is the author of the bestselling Bush Haters Handbook, its sequel, Bushit!, and 101 People Who Are Really Screwing America.